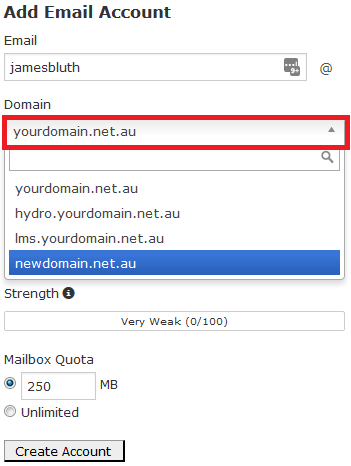 Note: If you want to create a different website for this domain, use the Addon Domains feature instead (click here for a guide). The domain will now redirect to the primary cPanel account. If you want to redirect the domain to a different website, click here for a guide on using the cPanel redirect tool. Now when adding an email account, you will can click on the Domain menu and select the Aliase or Addon domain to use.